Dr. Zhang received his test pilot license at the age of 52 and at the age of 54 completed a flight around the world. This year at 57 years old, he will fly around the world again to bring 2050 to the young people. 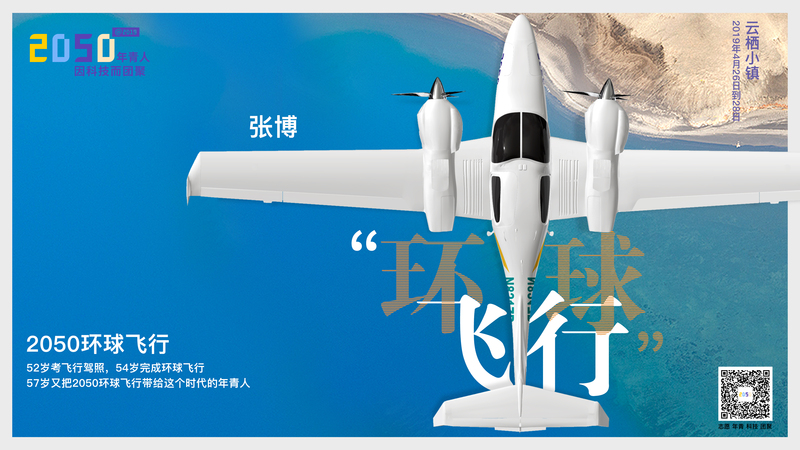 On April 2, Dr. Zhang Bo flew a small two-engine propeller-piston aircraft from Chicago, the United States, through the Arctic Circle of Canada, Greenland, Iceland, and then into the United Kingdom, Europe, along the Silk Road, Turkey and Kazakhstan, into the motherland, along Xinjiang, Qinghai, Gansu, Shaanxi and Jiangsu to Hangzhou, Zhejiang Province. During the three days of the 2050 reunion from 26 to 28 April, he will circle over the small town of Yunqi in Hangzhou. After that, he will fly to Russia through Beijing and Harbin, and through Siberia, Canada and the United States to complete the global flight. During this period, he will fly through more than 20 countries, with about 50 stops and a total voyage of nearly 50,000 kilometers, which is expected to take two months. This is the second time Dr Zhang Bo makes a round the world flight. This time, Dr Zhang Bo would like to make this flight because of 2050, because he wants to let youths see by his own actions that "flying is not far from us, the skies are not far from us". During this flight, there will be mysterious guest flying with him. 2050 volunteers along the route will welcome them. You can read more about this flight by following his weibo account "huanfeiboshi". Also, you can download FlightAware App, enter his flight number N821ZB, to see his real-time flight status.